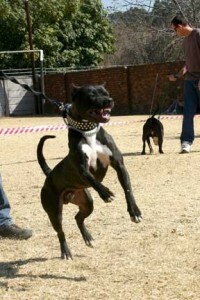 McKinnie’s Bumby Johnson aka Riddick ROM was imported from the States to RSA in 2004 by Kennel 44. He was a son off the great bolio dog GR CH Amboss POR x Total Velocity Kennel’s Maude (Maude being the sister to GR CH Lukane ROM, essentially making him a Redboy/Jocko x Bolio/Tombstone dog). He was accompanied by 2 females from Natural Born Kennels bred Hannibal x Gingerday (GR CH Mayday / GR CH Lukane / GR CH Yellow blood). 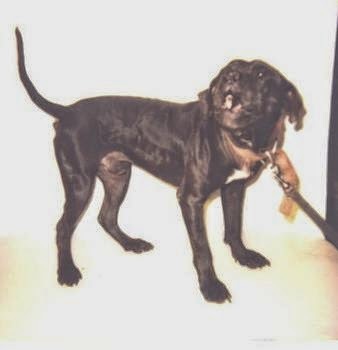 These females were Kennel 44’s Philadelphia and Darkside Kennel’s Clarice. Riddick funnily enough was not the dog RSA was to receive, in fact his brother was primed for RSA but only a day before the flight that pup climbed out his pen and was bitten by another dog. E-Roc being the honest and true friend he is ensured that JUK replaced the pup with Riddick so that the flight of all 3 pups could go ahead as scheduled. Riddick started his career in the hands of a novice handler/conditioner – Craven – who with only 1 show behind them decided to show Riddick into a 2xW off Frisco blood called Noah. Noah at the time was owned by the old time dogman MSK. In this show Riddick dominated from the beginning and disabled Noah’s front end. Riddick proved too much for Noah collecting the win in 51 mins. This was the last for Noah and he passed on. 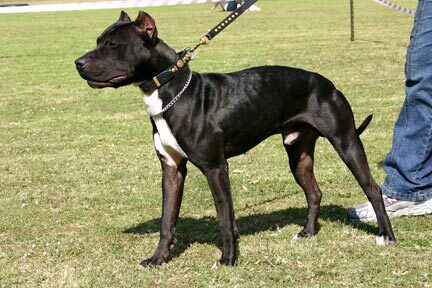 For his second show he was shown into a 1xW belonging to another seasoned dogger BBK called Shaiya. For this show Riddick travelled to the stomping grounds of BBK in the old ET but luck was not favoring Craven that day as Riddick was having some difficulty emptying out and his weight was far from ideal. Craven in haste decided to take Riddick for a run in order to lower the weight. This in fact did the trick but still he was not able to empty out. Enter Leprechaun, Craven called Leprechaun for advice on how to get Riddick to empty out and Leprechaun was furious that Craven had not called earlier, in any event Leprechaun advised Craven and after a few attempts he finally emptied out. The show went on and even with the odds stacked against him Riddick proved victorious in this show winning in 40mins. With both his opponents being proven dogs and quitting and in such a novice’s hands, Riddick was certainly making a name for himself when disaster struck. Riddick severed his Achilles tendon in a freak accident after it had been severely damaged just before his second show. It was re-attached but with the warning that he would certainly not be the same as before and discussions were had to retire the dog. Craven feeling a little over-confident and somewhat inexperienced felt Riddick could still be taken out for Championship. In the interim Riddick went on to complete his conformation championship. Finally after a long wait, Riddick’s third was to be against 1xW, 1xGL Gerry. This show proved to be extremely competitive with both dogs really trying to get ahead. Roughly an hour into the show Riddick had clearly re-torn his Achilles tendon and the stress of constantly trying to work on 3 legs took its toll and he started to turn blue. Craven and the corner debated picking him up, but Craven was adamant to push on further. After many scratches from both parties it was clear Riddick was unable to breathe and a handle was made at 2hours 36mins. 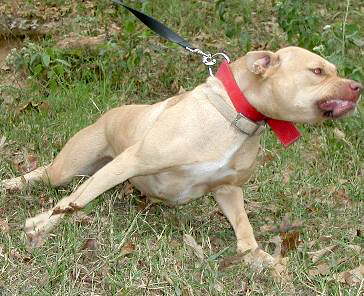 Riddick was taken to his corner where he slumped to the ground. Every effort was made to revive him and on the command ‘release’ he stumbles out of his corner to collapse half way across, taking the count. 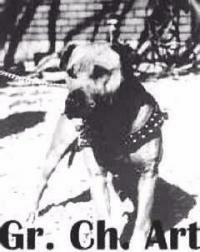 Riddick never took his eyes off his opponent, who being the quality he was went on to become CH Gerry. Riddick’s true potential was only to be discovered long after his show career had ended and that was in his ability to produce and to produce producers. Riddick was bred to only a handful of females as he was never available for public stud. The following are just some of the breeding’s made and the dogs he produced. When Riddick was still young he got out his pen and helped himself to a cold female named Tori from the Frisco/Bolio/SA Yellow bloodline that was the house dog at the time. He surprised us all by producing CH Al Capone (Cappy) 3xW,1xGL and Chi 1xW,1xGL. Riddick was then bred to Moonshadow’s (Seadensun’s) Jade 1xW,1xGL POR. 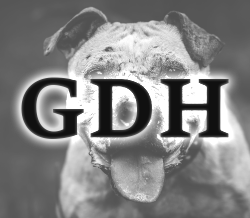 Jade was the daughter of RSA Digest ROM GR CH Grittler DOY. She was the sister to GR CH Talouse and CH Countdown POR. This was yet another outcrossed litter and in this litter Riddick produced CH Morrigan (Morgan) 3xW, Bounce 2xW and Diablo 2xW. 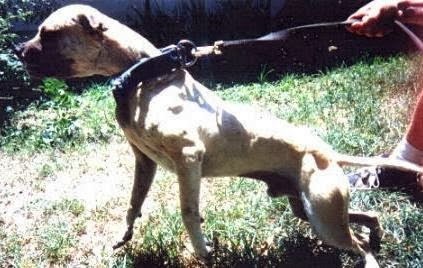 Riddick was then bred to the imported female from NBK, Philadelphia. It was again a super breeding and very compatible with Riddick’s own pedigree. This was to be the first real line breeding to take place with Riddick and whilst Philadelphia was not a titled dog, she was game. In this litter Riddick produced CH Dodge 3xW, CH Madison 3xW and Rat 1xGL. It was long after his death that this fairly outcrossed imported dog from the States, loved by few and hated by so many, further went on create a unique record for himself. 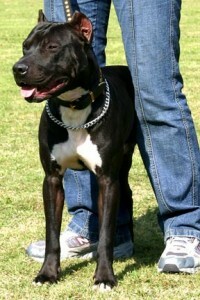 From the Riddick x Jade breeding both his son Diablo and daughter Jenny went on to achieve ROM status. Diablo produced GR CH Anderson 5xW, CH Boeta 3xW, CH Vegas 3xW, CH Bear 3xW, 1xGL and CH Braga 3xW. He also produced Creature 2xW, Delgado 1xW, Mona 1xW, Ridley 1xGL, Diablo Jnr 1xGL and Gatlin 1xGL. Jenny produced CH Hannah 3xW,1xL, CH Jon Small Jones 3xW, CH Boyler 3xW,1xL as well as Intemidator 2xW,1xL and Redbull 1xGL. From the Riddick x Philadelphia breeding his daughter CH Madison went on to become a POR, producing CH Bear 3xW,1xGL, CH Braga 3xW, Creature 2xW, Rokuko 2xW, Delgado 1xW, Mona 1xW and Ridley 1xGL. So what is so unique about the above? Well it’s unique because Riddick is the first and to date the only imported dog into RSA to ever produce 2 ROM dogs and 1 POR dog under the SDJ/international standards/rules.